During the META-FORUM 2011 which took place in Budapest (Hungary) on June 27th to June 28th , 2011, Linguatec has been awarded with the META Seal of Recognition. 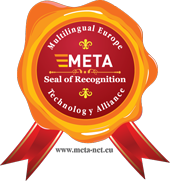 The META Seal of Recognition is awarded by the META Technology Council to software products and services that actively contribute to the European Multilingual Information Society. The META-Forum is an international conference on powerful technologies for a multilingual European information society. The conference, organized by META-NET, brings together representatives from leading European research centers, small and large technology corporations, translation services and other users of language technology. META-NET, a Network of Excellence consisting of 47 research centres from 31 countries, is dedicated to building the technological foundations of a multilingual European information society. META-NET is forging META, the Multilingual Europe Technology Alliance which brings together researchers, commercial technology providers, private and corporate language technology users, language professionals and other information society stakeholders. META will prepare the necessary ambitious joint effort towards furthering language technologies as a means towards realizing the vision of a Europe united as one single digital market and information space.